A cursory look at history reveals that Jesus’ life, death, and resurrection did not eliminate scapegoating. In fact, Christianity has a long and sad history of scapegoating, the victims at various times including people of color, women, homosexuals, people of differing faiths, and fellow Christians who do not share the particular Christian theology of those in power. Even the Passion, which should have revealed the scandal of the scapegoating mechanism, has been an impetus for scapegoating. Many Jews have suffered ostracism or violence because Christians have blamed “the Jews” for Jesus’ death. Those who have scapegoated “the Jews” have evidently neglected that Jesus and Jesus’ first followers (including his disciples) were Jewish. Neither Jesus nor his followers rejected Judaism; instead, they propounded a new theology grounded in Judaism. Indeed, it is not surprising that Jesus’ ministry found fertile ground among Jews. One reason for this is that Judaism had made great progress in the difficult task of revealing the scapegoating mechanism, exemplified best by the song of the Suffering Servant (see Part 22) and the writings of the later prophets (see Part 23). If Jesus had first presented his theology to Gentile communities, he would likely have been dismissed out-of-hand. Jesus tried to make clear that the scapegoating mechanism was universal and not particular to the Jews. Jesus cursed the Pharisees, “Therefore also the Wisdom of God said, ‘I will send them prophets and apostles, some of whom they will kill and persecute,’ that the blood of all the prophets, shed from the foundation of the world, may be required of this generation, from the blood of Abel to the blood of Zechariah” (Lk 11:49-51). Notably, neither Cain nor Abel was Jewish. Violence arising from mimetic rivalry, “shed from the foundation of the world,” is as old as humankind and has nothing to do with Judaism, per se. Also, Abel is not normally considered a prophet. However, Abel’s story is prophetic in that it, like the Cross, reveals the innocence of the scapegoated victim. Finally, as Rev. Nuechterlein has observed, “The crucifixion’s anthropological significance is lost if responsibility for its violence is shifted from all to some.” In other words, to the degree that Christians attribute the crucifixion to a group of bad people, the crucifixion fails to reveal the universal scapegoating mechanism. We fail to appreciate the full significance of the Cross if we fail to recognize that, every time we scapegoat, every time we fail to reflect God’s love and forgiveness, we are participating in the crucifixion of Christ. Jesus said that whatever we do to “my brethren,” we do to him (Mt 25:35-45). Should we consider animals among Jesus’ “brethren”? I think so. 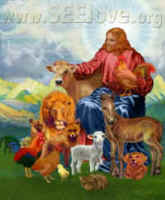 The Bible teaches us that God cares for animals and Jesus cares for animals. Whether we should regard animals as equal to humans is not the issue. They are weak, vulnerable, and able to suffer and, consequently, are undoubtedly among the “least of these.” Humankind’s cruelty to animals is a form of sacrificial violence (see parts 28-30) and is part of the ongoing crucifixion of Christ. Next week, I will further explore ways in which I think Christians have often misunderstood the passion story, which has contributed to scapegoating violence.